Noctilucent Clouds over Kustavi, Finland. Photo taken July 27/28, 2001, at approximately 12:30 AM local time or 4 hours after sunset. This image shows a noctilucent cloud illuminating the water below and a gold hue on the horizon. Ever since something generated a huge explosion over Siberia in 1908, flattening an area as big as a large city, scientists have been trying to figure out what caused it. Among the enduring mysteries: Following the explosion, the night skies shone brightly for several nights across Europe all the way to London, 3,000 miles away. While there are some wild theories about the Tunguska event -- involving a UFO or black hole or a bizarre death ray -- astronomers have long known the culprit was either a comet or an asteroid. Based on the lack of a crater, scientists say the object did not smack into the ground, but rather exploded above the surface, the damage being done by the resulting shock wave. But which type of space rock was it? New evidence from an unlikely source -- water vapor in the exhaust plumes of space shuttles launched a century later -- points to a comet. The potential solution comes courtesy some strange clouds that scientists have only recently begun to understand. 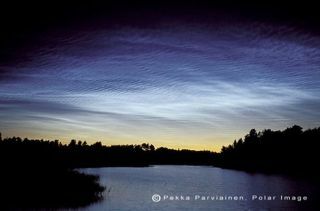 Noctilucent clouds are brilliant, and visible only at night. Made of ice particles, they are Earth's highest clouds, forming in the mesosphere some 55 miles over the polar regions during the summer months when, up there, it is around minus 180 degrees Fahrenheit (minus 117 degrees Celsius). The ephemeral noctilucent clouds are relatively new, at least to scientists. According to Gary Thomas, a professor at the University of Colorado, they were first seen in 1885, about two years after the powerful eruption of the Krakatoa volcano in Indonesia, which hurled plumes of ash as high as 50 miles (80 kilometers) into Earth's atmosphere. They were photographed by astronauts aboard a space shuttle flight in 2003. And in fact, space shuttle launches have been found to cause or enhance the formation of noctilucent clouds. About 97 percent of the exhaust from a shuttle launch turns into water, a by-product of the liquid hydrogen and liquid oxygen fuel. A single shuttle flight pumps 300 metric tons of water vapor into the Earth's thermosphere, and the water particles have been found to travel to the Arctic and Antarctic regions. Noctilucent clouds were tied to the launch of Endeavour (STS-118) on Aug. 8, 2007. And high-altitude clouds were detected over Antarctica shortly after the fateful launch of Columbia, which along with its crew was lost during re-entry. Columbia's plume was 650 miles long and 2 miles wide and reached Antarctica in three days. Cornell University engineering professor Michael Kelley figured the bright night skies after the Tunguska event must have been the result of noctilucent clouds. And since they require water vapor, Kelley assumed a comet was the culprit. The explosion on June 30, 1908, flattened some 500,000 acres (2,000 square kilometers) of Siberian forest. Estimates are the Tunguska Event was as strong as at least 10 megatons of TNT and perhaps a thousand times more powerful than the atomic bomb dropped on Hiroshima. Just last year, many experts were figuring it was an asteroid. But Kelley's team thinks a comet fits better, since comets are loaded with water ice (asteroids are mostly rock and metals). The comet would have started to break up at about the same altitude as the release of the exhaust plume from the space shuttle following launch, they calculate. In both cases, water vapor was injected into the atmosphere. But how did the water vapor travel so far? "There is a mean transport of this material for tens of thousands of kilometers in a very short time, and there is no model that predicts that," Kelley said. "It's totally new and unexpected physics." Kelley and his colleague say a new model of upper-atmospheric physics is needed. They propose counter-rotating eddies with extreme energy. Once the water vapor got caught up in these eddies, it traveled very quickly -- close to 300 feet per second, they write in the June 24 issue of the journal Geophysical Research Letters. "Our observations show that current understanding of the mesosphere-lower thermosphere region is quite poor," said Charlie Seyler, Cornell professor of electrical engineering and a co-author of the research paper. Meanwhile, the infamous Tunguska mystery has taken yet another turn. "The evidence is pretty strong that the Earth was hit by a comet in 1908," Kelley said.